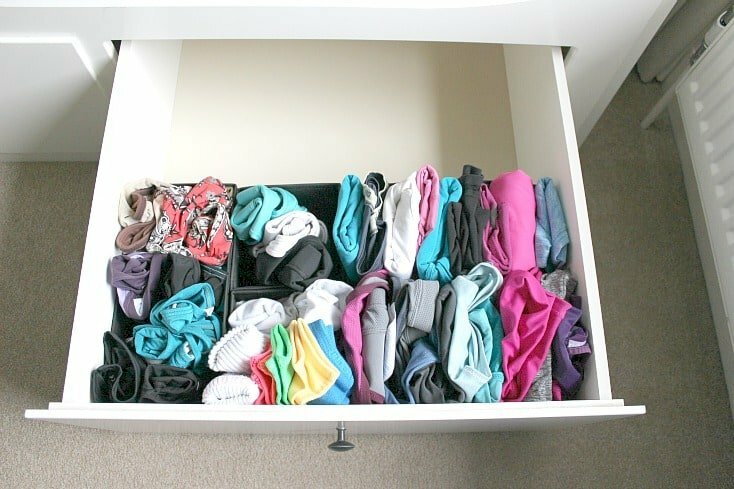 Create a fitness drawer to organise your workout clothes with this easy step by step guide. Your workout gear will be simple to grab when you need it, and not mixed up with all your other clothes in your wardrobe. Perfect! My fitness clothes were a mess. It’s one of those areas of clothing that can get missed all too easily, because most other clothes seem to take priority in the wardrobe or chest of drawers. But, if you’re like me, and you enjoy going to the gym – it’s time to get your workout gear sorted. Once and for all. 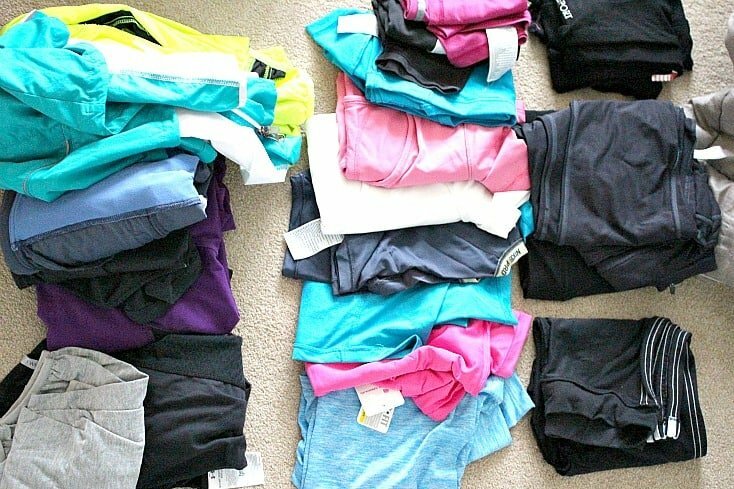 WHY DO YOU NEED TO ORGANISE YOUR WORKOUT CLOTHES? I always have a “why” in mind when I set about organising any area of my home. Mainly because I want to be as motivated as possible to get the job done well, but it also helps to know what I need from doing it. I want to find them quickly. If the mood hits to exercise in the morning, then I don’t want to be hunting through all my clothes to find what I need. It will make it more likely that I’ll exercise because I can find everything faster. There are several items needed for each workout outfit – so being able to see each of them at a glance makes things simple. Now, I don’t have a whole lot of space for my clothes. At all. In fact – the wardrobe space you see is for myself AND my hubby. And that’s it. About a metre of hanging space each, 3 shelves, and 2 drawers. Roughly. 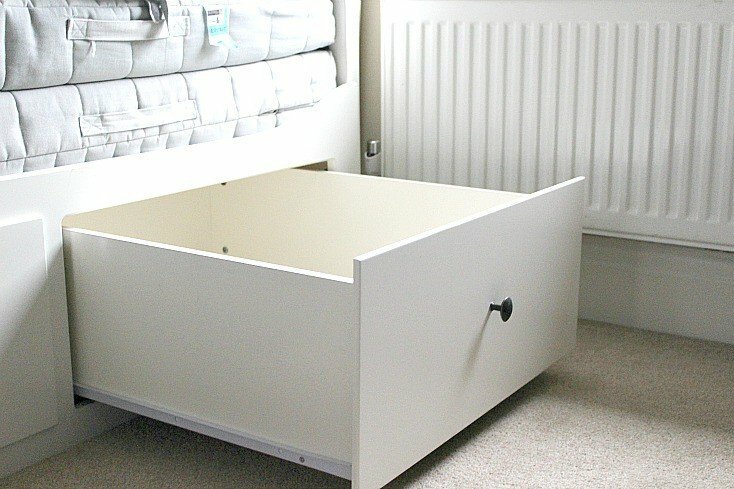 … and I’ve already talked about using chests of drawers for bedside tables, which adds some clothes storage to the room as well (really handy place for underwear!). This is pretty much enough for us, as we tend to keep everything out (no seasonal swaps), and use it all regularly. It also stops us having too many clothes, because it’s all too easy to fill the space you have, but we still needed a little more space for the stuff that doesn’t need to be in our day to day clothes storage. Our fitness clothes / workout gear. By the way – this is a photo of my wardrobe when I was sorting it out – it doesn’t normally look like this! So – it was time to think about the space in a different way – and maximise what other spaces we had that would be a good fit for the fitness side of things. The fitness clothes were at this time all in one of the larger drawers at the bottom of my wardrobe – which was working well – but because these clothes were taking up space in my bedroom, I was having to use a drawer in another room for jumpers. As such it made total sense to move my fitness clothes out of the bedroom and into the drawer in the spare room instead (part of the day bed that we have there which works really well for occasional guests). This meant that a category of my clothes that didn’t relate to any others could be stored together and accessed easily when I need them, but that wouldn’t take up valuable prime storage space in my wardrobe. It was a nice deep drawer and so with the amount of fitness clothes I had, it seemed like a good choice. TIP – Always think with the big picture in mind when organising any area of a room. Where something is currently situated may not be the best place for it and so it makes sense to move it first before organising – as that way it will be much more fit for the job in the end. As with my organise anything in 4 steps post – the organising starts with “Like with Like”. I had already decided on the drawer that I was going to use – but this was of course just one large space, and everything would get mixed up pretty quickly if I wasn’t more careful. As such I turned to my trusty drawer dividers from IKEA that I use for many drawers in my house. They are versatile and come in quite a few colours – and I think they work perfectly to divide a space up. 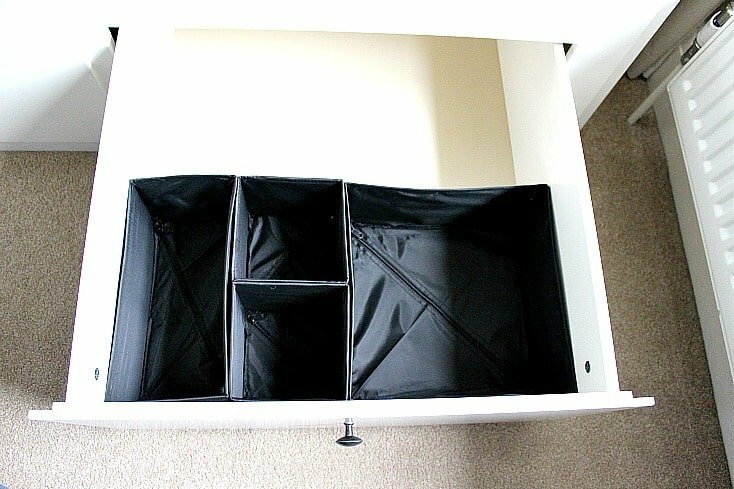 I already had a set of black dividers from a project a while ago, so I simply worked out the best configuration for them inside the drawer, based on space available and what I wanted to store (the categories of clothes). So – I had chosen the place for all my clothes, and added extra storage help within it – now was the time to start filling it up! TIP – I always try and use a filing technique with my storage – as you can see from the picture above, this means that you can see everything easily rather than stacking it on top of each other and having to sort through. It also meant that I could utilise the deep drawers much better in this instance. As you can see, all items of clothes can be seen, and that way I can pull out what I need easily without making a mess – and when I come to put items back in the drawer I know exactly where they go as they have a space. Things could have been folded a little neater I grant you, but you get the idea! For those of you who know my methods well by now, there is one last step to my organising system – and that’s to label or tag the space you have just completed. I am the only one who uses the drawer – and I know very easily where everything goes. 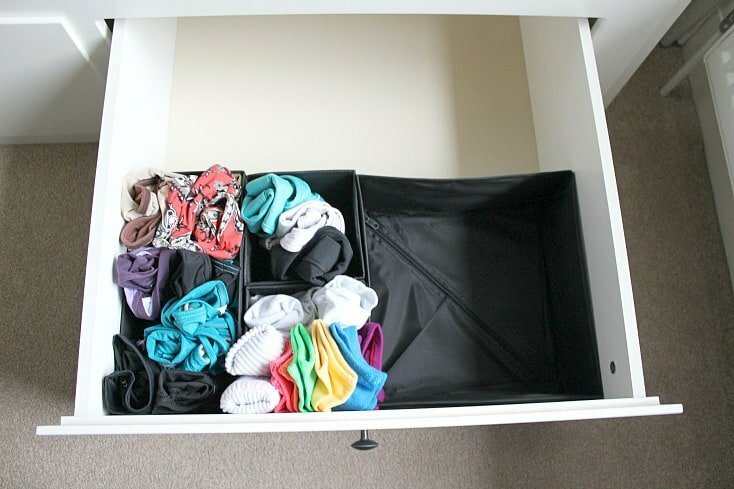 The drawer is all for fitness clothes – so it’s very obvious when you open it up what’s in it. 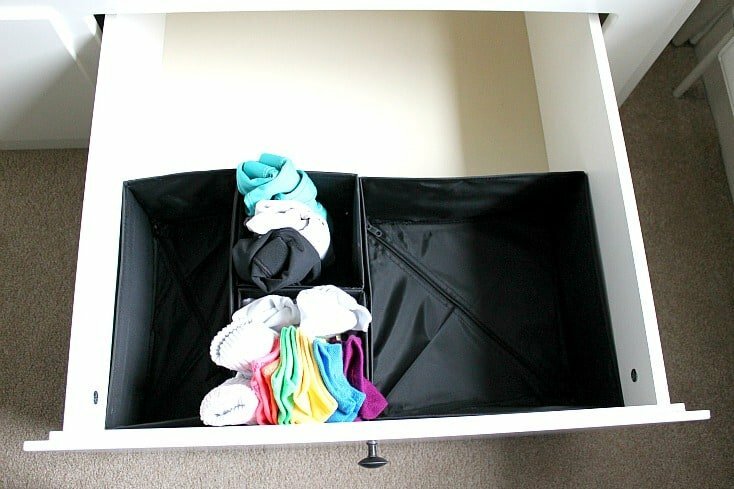 My workout clothes storage organisation is simple, but VERY effective! The whole thing probably took no more than half an hour to complete once I had everything I needed ready to go – and it’s made such a difference to being able to find what I need quickly. I love that I now have these clothes in the spare bedroom, as they are out of the way for day to day life, but still really easy to get hold of when I need them, and they have indeed helped me to free up much needed space in my wardrobe for the stuff I do wear daily. 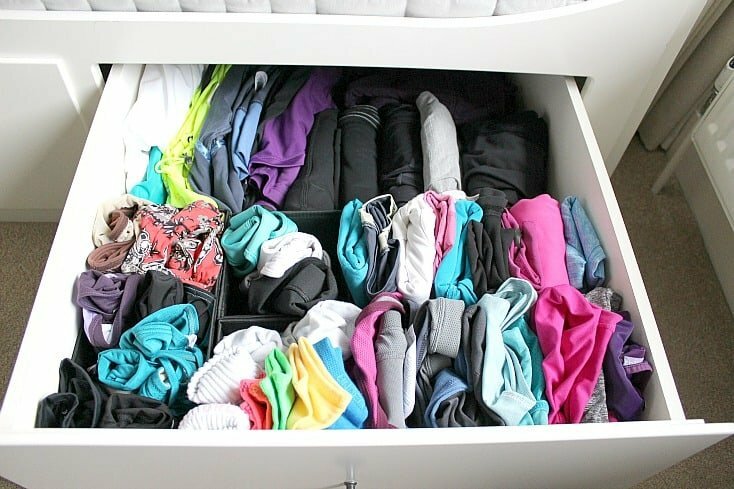 So – why not sort your fitness clothes drawer this weekend as a quick project? It is such a relief to have an area that’s ready to use like this, and I’m sure you’ll love it! P.S. 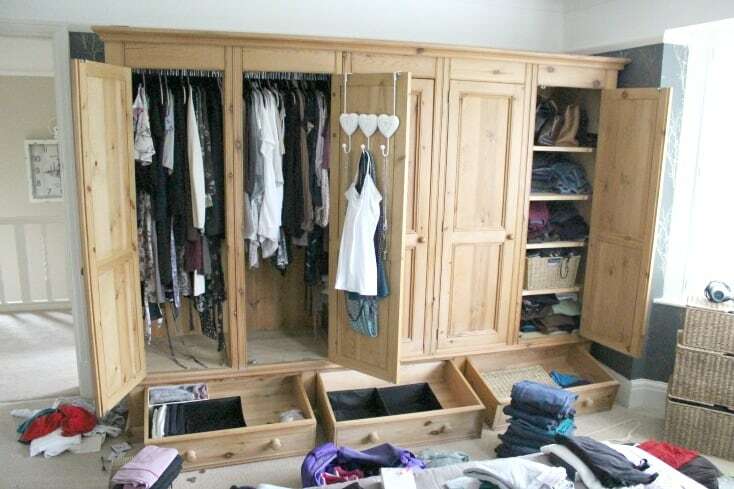 If you’re ready to tackle your WHOLE wardrobe, why not check out the step by step 3 part series of wardrobe organisation – This takes things to another level!